Ig Perrish (Daniel Radcliffe) wakes up one morning to find horns growing out of his forehead. Soon, he discovers that when people look at them, they reveal their deepest, darkest secrets, giving Ig the opportunity to solve his girlfriend's murder, for which he is the prime suspect. Alexandre Aja is a director that seems to be having fun. Since HIGH TENSION he's been a consistent genre director. With the exception of MIRRORS, his films have been pretty inspired, with his HILLS HAVE EYES remake being way better than it had any right to be, while PIRANHA 3D was probably even better than the Roger Corman cult classic that inspired it. But, a remake is one thing, while something original is a whole other thing. 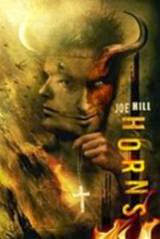 HORNS is based on the novel by Joe Hill, at it's probably Aja's most ambitious movie to date. While his previous films have been heavy on the splatter, HORNS is a mash-up of several different genres. It has supernatural horror elements, but it's also mixed it with heavy doses of black comedy and most importantly, romance. At it's heart, HORNS is a tragic love story, with Juno Temple's Merrin being dead before the opening credits roll. Their relationship unfolds through flashbacks and stories being told by the suspects Ig interrogates with his horns, giving this a hearty tinge of film noir. Mixing and matching genres is a pretty tricky thing to pull off, but Aja seemingly does it with ease. While it runs a shade too long at over two hours, for the most part HORNS is a super-solid horror thriller. In fact, I'd say it comes awfully close to being excellent, were it not for one serious flaw- Daniel Radcliffe. Radcliffe is usually a pretty good actor, even when he's not playing Harry Potter. He has two movies at TIFF this year that show that- THE F WORD and KILL YOUR DARLINGS. But in HORNS, he has to play tough and if there's one thing Radcliffe is not, it's tough. Shia LaBeouf was the original choice to play Ig, and while he's hit and miss, he would have been perfect as the scrappy Ig, who's like a little pit-bull (Aaron Paul would have been even better). It's certainly a stretch, with him ditching his UK accent, and playing a guy that's supposed to be a ne'er-do-well, with characters telling him over and over again that his only redeeming feature is his relationship with Merrin. And that's the problem; Radcliffe just seems like way too nice a kid to be playing a “bad boy”. The rest of the cast is more ideally suited to their parts. Juno Temple, who often plays eccentric, “weird” characters does well playing the kind, idealized Merrin, although she's so perfect she seems more like an angel than a real person (which I guess is the point). David Morse as her angry, bible-thumping father manages to make a cliché seem relatively three dimensional, while James Remar and Kathleen Quinlan as Ig's parents, each have a memorable scene when confronted by the horns. The two scene-stealers here are Joe Anderson as Ig's drug-addled brother- taking another potentially stale role and giving it nuance- and Max Minghella as Ig's childhood friend turned lawyer, and the one guy his horns don't work on. Of course, while HORNS is a mash-up of lots of genres, being an Aja film, you can expect a little splatter, particularly close to the end, with his characteristic, almost funny splashes of ultra-violence. But, given the surprising sweetness of the story, HORNS could have a lot of appeal beyond horror fans, and it should elevate Aja's career, which would be great as he really does have a lot of talent. While I have serious issues with Radcliffe's casting, the movie as a whole is still very entertaining and well-worth checking out.